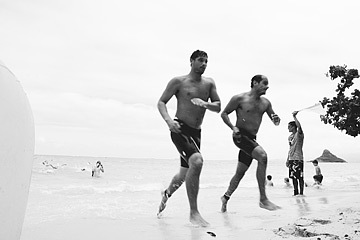 Competitors hurried out of the water during the swim portion of the annual Jamba Juice Mountain Man Triathlon at Kualoa Saturday afternoon. Former Hilo resident Kimberly Kim was named to the U.S. women's world amateur team, according to CSTV.com. Kim will be part of the team that competes in the Women's World Amateur Team Championship, Oct. 18-21, in Stellenbosch, South Africa. Kim, who now lives in Arizona, became the youngest U.S. Women's Amateur champion earlier this month and also placed second in the U.S. Amateur Public Links earlier this summer. » Kirk Nelson carded a 6-under 66 yesterday for a three-stroke lead after the first round of the Mauna Kea Resort Stroke Play Championship yesterday on the Big Island. Defending champion Kevin Carll is in second place with a 3-under 69 heading into today's second round. » The University of Hawaii placed seventh in the Eddie Hogan Cup golf tournament last weekend at Portland, Ore. UH, which finished at 13-over 445, was led by Henry Park, who shot a two-round total of 2-over 146. USC won the tournament at 10-under 422. Hawaii senior hitter Sarah Mason did not participate in yesterday's Rainbow Wahine volleyball practice, watching from the sidelines and wearing a protective walking boot on her left foot. Mason suffered a mild sprain of her left ankle during a scrimmage Saturday, a diagnosis which had not changed as of yesterday. She could be back practicing as early as this afternoon, according to trainer Renae Shigemura. The 6-foot-3 Mason had been expected to start at right-side hitter Friday when No. 7 Hawaii hosts No. 19 Pepperdine. Hawaii Pacific opens the 2006 season ranked 13th in the AVCA Division II coaches women's volleyball poll. The three-time defending Pacific West Conference champions advanced to the Pacific Region semifinals last year and finished 24-3 with a No. 8 ranking. Brigham Young-Hawaii is ranked 21st in the coaches poll after finishing last season 20-5. Chaminade men's soccer coach Bob Barry has announced the signing of four players for the Silverswords initial season. Midfielder Kirtus Adams, the 2005 Interscholastic League of Honolulu Player of the Year, and goalkeeper Darren Smith, the 2003 Oahu Interscholastic Association Player of the Year, top the list. Ryan Hall, an all-league goalkeeper from Peninsula (Wash.) College, and Chad Nishikuni, a former Maui Interscholastic League all-star from Baldwin, have also joined the Silverswords.